When I arrived, a little before 2 p.m. Tuesday, Alex Austin was the lone player in Ubben #2, the men’s gym. He was shooting threes with The Gun. Later in the day, he would be the top three-point shooter among his teammates, and the only player to hit more than one. Tracy Abrams (Bruce Douglas Jersey winner) and Malcolm Hill (Augustine Jersey Winner) were the next players on the court. Jaylon Tate came next. He worked extensively on his three-point shooting, but without The Gun. Instead, team managers wrangled the rebounds and Jamall Walker fed the passes. Tate hit about 60% from the arc. Really. I have video to prove it. The team’s practice began with a walk-through of the Dribble Hand Off, which John Groce calls “hippo.” At last week’s open practice, this terminology confused Larry Brown, who refers to it as D-H-O, just like the rest of the basketball world. Groce asked the team whether anyone would like to add something to his lesson, Maverick Morgan piped up. He said it’s hard for big men to recover defensively after a high ball screen hand-off, because you have to run through somebody to do it. Of the media that showed up, only Derek Piper and Scott Richey stayed for the whole show. I suppose the others had to be back at the station by airtime. Josh Whitman and Warren Hood each watched a portion of the practice. A small group of (ostensibly Orange Krush) students observed from the balcony. Whitman came over to say hello. I asked about the mark under his right eye. He said it dates back to sixth grade, and that you can tell when he’s tired because it grows increasingly red. He added that it’s been red a lot lately. 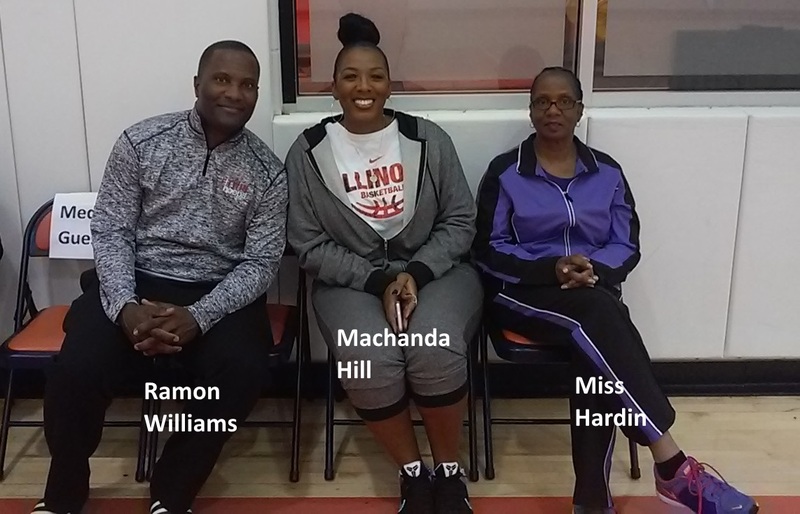 At the south end, erstwhile DePaul coach Joey Meyer joined Machanda Hill and her mom (Malcolm’s grandmother “Miss Hardin”) and Ramon Williams, who was John Groce’s first Special Assistant to the Head Coach at Illinois (for about 15 minutes) before accepting an assistant coaching job at Virginia Tech. He’s now a major gifts officer at his alma mater, Virginia Military Institute. On the day, Kipper Nichols, Te’Jon Lucas, Aaron Jordan, Malcolm, Tracy, Michael Finke and DJ Williams all connected once from distance. Abrams’s three came as time expired in the third scrimmage, from about 25 feet. Jordan and Jalen Coleman-Lands each airmailed a three. JCL’s right hand was wrapped and padded. He made some great passes. In the second scrimmage, Tracy Abrams moved to the PG position after playing only the 2 in the first round. Kipper Nichols got his first court action, spelling Leron Black at PF. In the 5-on-0 drills, he frequently dribbled the ball two or three times after catching a pass at the free-throw stripe. If he ever dribbles in the high-post, the ball will be stolen. 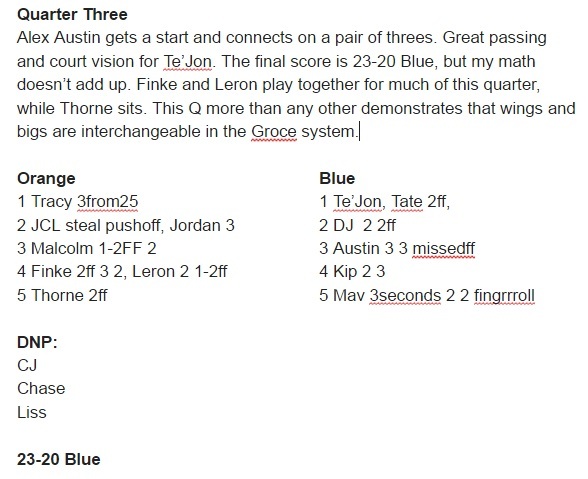 Thorne invariably pumps the ball (brings it down to the level of his abdomen) before attempting a short jumper. Keeping the ball high would be preferred. Thorne used his left hand to connect on short hook shots. Everybody agreed that he should expand that usage, because it’s really hard to guard. 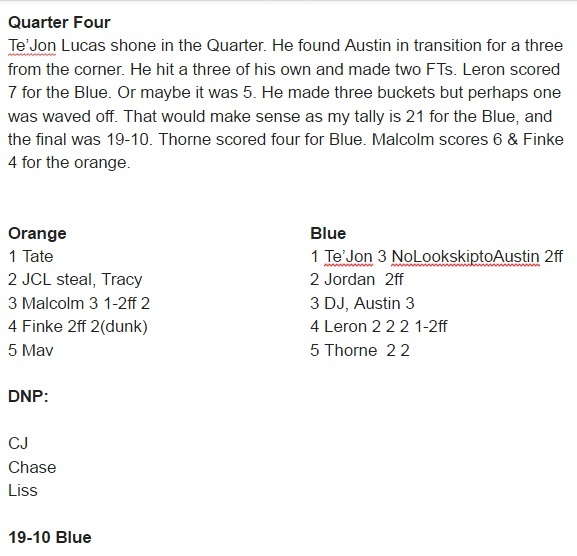 And speaking of unnecessary flourishes at the Five Spot, Maverick Morgan was mid-dunk when he instead chose a dainty finger roll for his second bucket of Quarter Three. The ball was already in the cylinder when Mav opted for his theatrics. Lou Henson would have benched him immediately. I screwed up the math in this quarter. 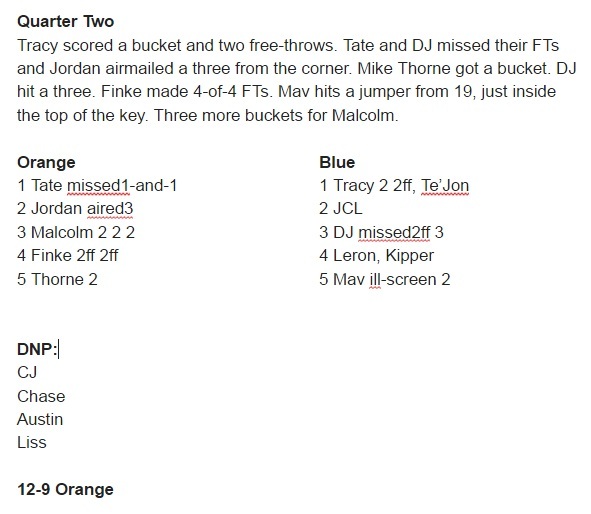 The final was 23-20 Blue, with Tracy Abrams nailing a long three as time expired. My marks and notations, kept in a GMail draft on my phone, don’t add up. It could be that I put Jaylon Tate on the wrong roster. There’s no 0 or B in my notes to demarcate his team. I’ve already forgiven myself. It’s hard keeping stats. Te’Jon Lucas looked really good in transition, but what about playing within the system? He’s got a lot to learn. His best performance came in the latter half of the four scrimmages. 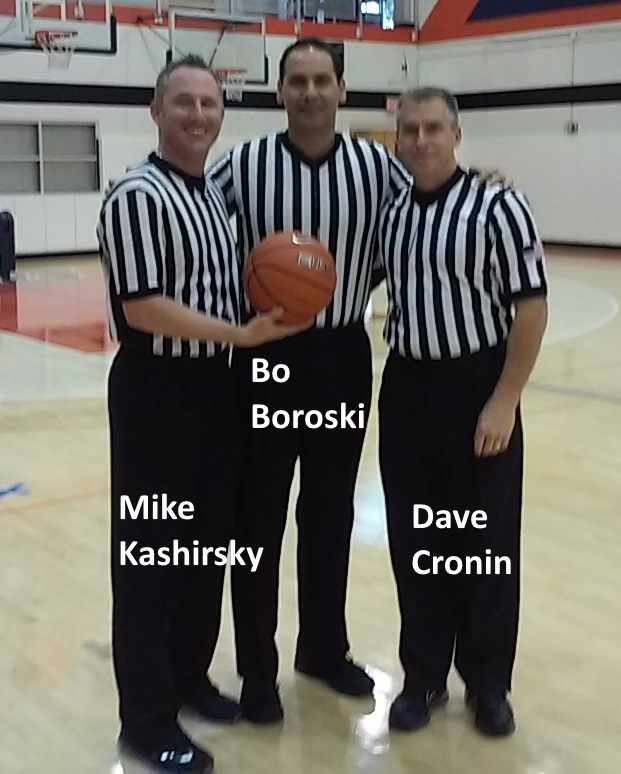 Referees Dave Cronin, Mike Kashirsky and Bo Boroski performed not only normal officiating duties, but also explained rulings to players where possible (e.g. dead ball). At the conclusion of the four 8 minute scrimmages, Boroski stood at center court, with the team in a circle around him, and explained the NCAA’s new tweaks to various rules. Especially important this year, Boroski explained, is the “cylinder” that rises from a player’s feet. That cylinder must not be breached by a defender, but must also not be exploited by the offensive player. Jaylon Tate, JCL and Tracy Abrams were all whistled for push-offs (raising an arm to move a defender away from the ball). 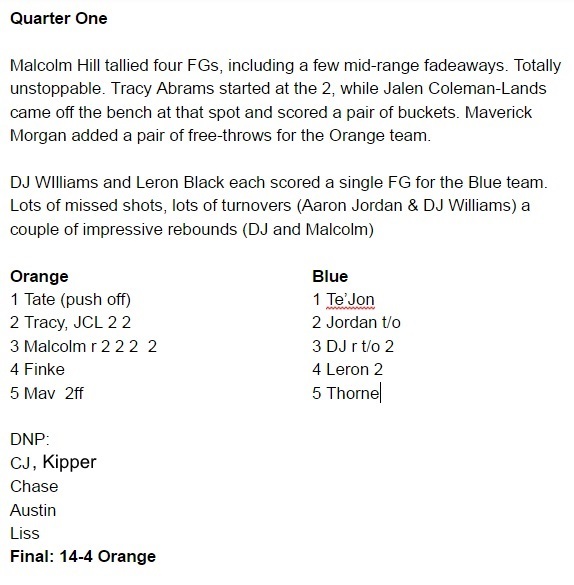 Maverick Morgan (and I think Aaron Jordan) were penalized for illegal screens. Leron Black continues to be a rebounding fool and a fouling machine. He too was whistled for pushing-off, on the low block. Jamall Walker may have used the word “shitshow” to assess the afternoon’s display of missed shots, turnovers and fouling. I don’t actually remember. But that was the sentiment. Finke agreed it was pretty bad, but considering it’s the first time the entire roster was available (i.e. cleared to play), their inability to mesh is understandable. D.J Williams is #2 at the wing, lock it up. Aaron Jordan is playing the two, and you might see Abrams playing a lot there as well. D.J should see some action this year, and maybe that means having him on the court at the same time as Malcolm. In the Groce offense, it really doesn’t matter who’s labeled the 2 or the 3. The PF and C positions are also interchangeable. Despite connecting on a three-pointer, Kipper Nichols is confined to the PF position for now. That’s odd, because during Media Day, everyone insisted Kipper is a three, including Kipper. It would be great to see D.J. and Finke at PG, just to screw with the opponent. And I’m not kidding about that. They’ve both played the position, and DJ especially has the quickness to defend an opposing PG. Does John Groce think outside that particular box? It would be awesome if he did.